Driving safety for older adults requires more than understanding traffic rules and road signs. As seniors age, they may notice their driving abilities change and become more difficult to manage due to eyesight issues, physical changes, and more. Here are a few safety tips for elderly drivers. When driving, seniors who wear glasses need to make sure they’re wearing a pair with a current prescription. If your loved one’s glasses break, make sure he or she doesn’t drive with an old pair of glasses with a weaker prescription, as it could make the road and other objects less clear and put your loved one and others in danger. Also, your loved one should avoid wearing glasses with side pieces that might impair his or her vision when driving. Seniors should never wear tinted glasses or sunglasses at night, as it can reduce the amount of light that reaches their eyes and make driving more dangerous. If your loved one is very sensitive to light, he or she should visit the eye doctor for possible correction. Because driving requires clear vision, seniors who have ongoing vision issues should give up driving and allow family members or caregivers to provide transportation. Rhode Island home care experts are available to provide high-quality care to seniors on an as-needed basis. From assistance with mobility and exercise to providing transportation to the doctor’s office and social events, there are a variety of ways professional caregivers can help your aging loved one continue to live independently. Driving at night is often daunting for seniors. At night, their visibility may be reduced, especially if they have an eye ailment. Glare from dirty headlights, mirrors, and windshields could worsen the issue. Your loved one can make driving safer at night and reduce glare by making sure his or her mirrors, windshields, and headlights are always clean. Also, your loved one should align his or her car’s headlights to further reduce glare when driving in foggy conditions or at night. You can also arrange for a professional caregiver to provide transportation at night. When searching for reliable Rhode Island home care agencies, families want to know their senior loved one will be well taken care of. At Home Care Assistance, our expertly trained caregivers are available around the clock to assist with tasks around the house, provide transportation to medical appointments and social events, and much more. 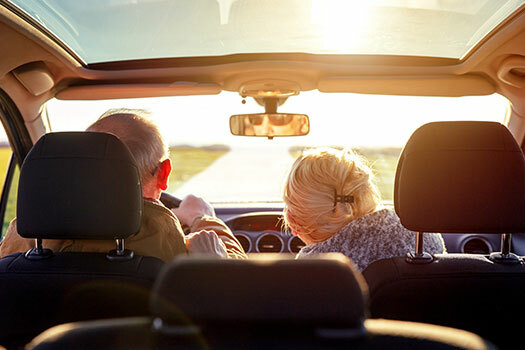 Older adults should make sure they sit high enough in their seat so they can see at least 10 feet in front of their automobile and have a clear view of the road. This can also make a big difference in lessening the amount of glare they experience from another automobile’s headlights. If your loved one can’t raise the seat, he or she can use a cushion to reach the right height. A blind spot can hinder the view of another vehicle. Most of the time a blind spot-related accident occurs while changing lanes. The driver’s side blind spot can be eliminated by readjusting the side mirror. Your loved one should put his or her head against the window and adjust the mirror outward so it’s barely visible when he or she looks at the interior edge of the side of the car. If your loved one is using a wide-angle mirror, he or she should practice judging distances to other automobiles before using it in traffic. Seniors need to keep alert and concentrate on the sounds around their car. They should keep passenger conversation as well as background noises from the stereo to the radio at a minimum. Distractions such as these could cause your loved one to lose his or her concentration, which could lead to a mishap on the road. Seniors who wear hearing aids should be careful about opening their car windows. Some older adults have found drafts can impair the effectiveness of their hearing aids. Being able to drive is an incredible source of independence. However, age-related challenges can make driving dangerous for seniors. Aging adults who need help around the house, transportation to medical appointments and social events, and assistance with exercise can benefit from having an in-home caregiver. Rhode Island seniors can enjoy greater independence and receive regular mental and social stimulation when relying on a trusted professional who is expertly trained in various aspects of senior care. To speak with one of our Care Managers and schedule a complimentary consultation, please call (401) 284-0979 today.